Ever wondered what it would be like to go inside an Amish home, make Amish friends, or go to an Amish wedding? In this sequel to Ashley's Amish Adventures: An Outsider Living With the Amish, now you can experience it all for yourself! In this second book of the series, bestselling author Ashley Emma returns to the Amish community of Unity, Maine to attend an Amish wedding. Because of this journal's rare photos, you will literally get to see the places you are reading about as you read. 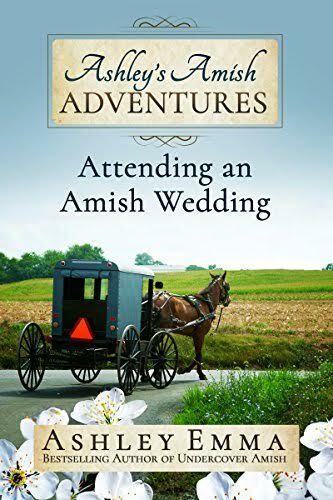 In the first book, twenty-year-old Ashley experiences the Amish way of life as she rides in buggies, attends church, makes cheese from scratch, helps make 100 quarts of applesauce, bakes Amish desserts in a bakery, learns Amish customs, and teaches in the schoolhouse. In this continuing story, Ashley does several of these things again, reunites with her friends in Unity, and also has lunch with an Amish family who is close to her relatives in Lancaster County, Pennsylvania. Why do the Amish wear old-fashioned clothes? Why don't they use electricity? What does a day in the Amish life look like? These books will not just answer these questions, they will show you what it truly means to be Amish. Come along to experience this extraordinary group of people and join Ashley on these amazing Amish adventures! Don't miss the first book in this series, Ashley's Amish Adventures: An Outsider Living With the Amish. Visit ashleyemmaauthor.com to download three free eBooks!